Jana Sim: "My work is about the difficulties I face[d] living as an International Student and the cultural differences between Korea and the United States." Chicago, Illinois: Jana Sim, 2011. Edition of 15. 5.25 x 3.125 x 2.25" lidless cloth-covered box housing one Möbius strip constructed of Somerset paper. 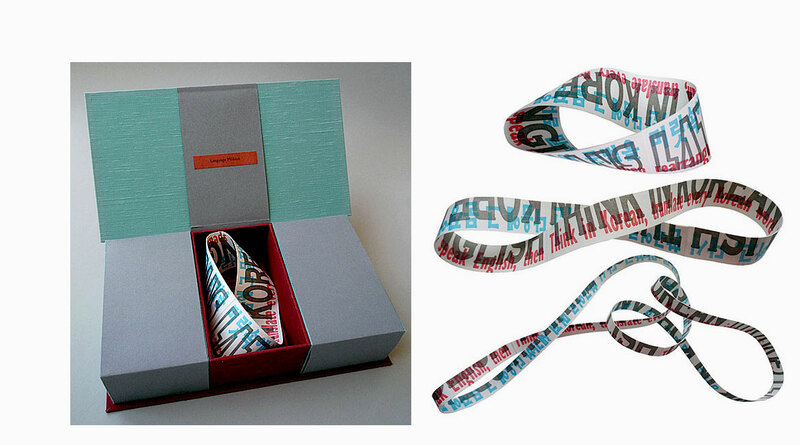 Text in Korean and English is letterpress printed on the Möbius strip. 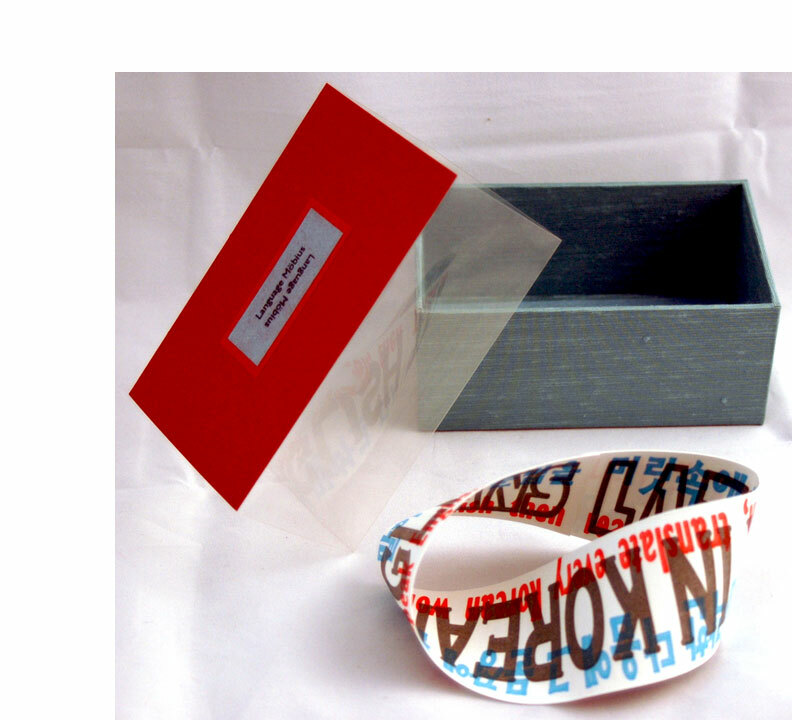 Slip on band with three sides of clear acetate and top of heavy paper with colophon adhered to interior and paper title label on exterior. Signed and numbered by the artist. 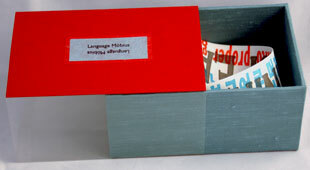 A trade edition of Sim's original book Language Möbius. While the original had three Möbius strips of differing sizes symbolizing the frustration of learning another language, this trade edition provides a single Möbius strip to illustrate and symbolize the difficulty. Jana Sim: "The most difficult part of learning another language is everyday conversation where an immediate response is needed. Language Möbius is about my conversation process. The loop in my brain goes like this: hearing English, thinking in Korean, translating, then speaking in English." [Chicago, Illinois]: Jana Sim, 2010. Edition of 32. 8.5 x 7.5 x 1" (closed) 20 x 7.5 x 6" (opened); 28 pages. 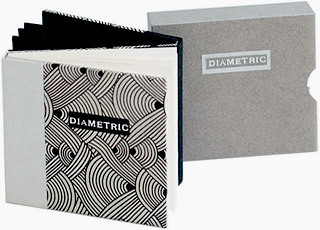 Various parts of the book are bound in gatefold and drumleaf formats. Most is letterpress printed using polymer plates on Somerset white velvet. 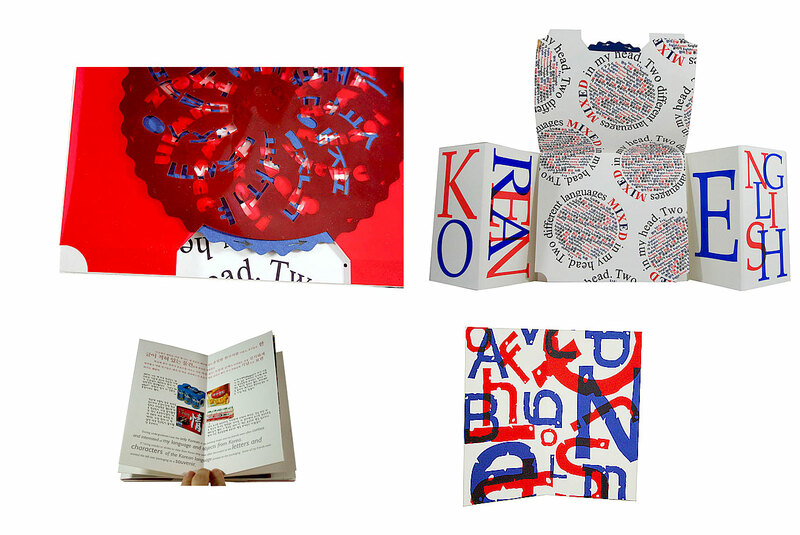 Includes a volvelle of laser-cut Canford Royal Blue paper and Grafix Clear-Lay Red acetate. Laid in a box covered in eggplant-colored silk with gatefold lid. Button and thread closure. Jana Sim: "This book is about the differences between how language is observed and interpreted. When one knows a language it becomes natural and you are able to understand the meaning. However, upon seeing a language that you do not know it can be seen as merely beautiful shapes and not as text that you can read. The language then becomes a texture of patterns or images. 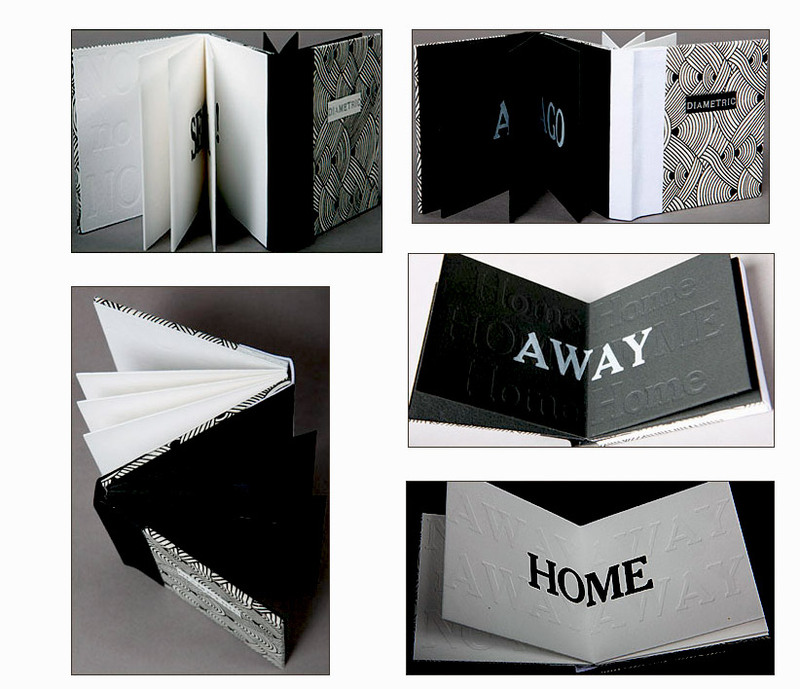 "Konglish is an artist book about living with two languages. My focus is on three languages: Korean, English, and Konglish (Korean + English), which is the term used for English words in a Korean context or words made from a combination of Korean and English as a sublanguage in the Korean American community. "One side [of the gatefold structure] focuses on Korean and the other side on English. There are short, humorous stories in each language that I have personally experienced based on the differences of the languages and how they function in different cultures. How Korean appears to English speakers and how English appears to Korean speakers are different and sometimes led to funny mistakes and experiences causing misinterpretation or confusion. 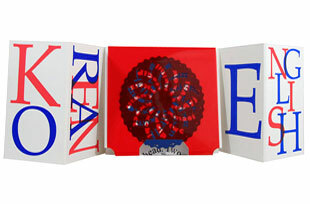 "When the books is closed, the word KONGLISH appears on the front, combined from the words Korean and English, which can be seen in full once the book is opened. Two laser-cut Volvelles in the middle of the book appear once [the "gates" have been opened]. The wheels have a mixture of both Korean and English alphabets. "The book will be very different depending on what language you are able to speak. If you only speak English, the Korean side will be seen as exotic shapes and patterns and vice versa. If you understand both languages, you will be able to compare the two sides, understand both sides of my stories." [Chicago, Illinois]: Jana Sim, 2008. Edition of 7. 3.5 x 3.5 x .75"; 16 pages including pastedowns. Dos-à-dos construction. Letterpress, embossing, and hot foil stamping. Papers: Somerset and Lokta. Bound in book cloth and cowhide leather. Paper slipcase with title label. Jana Sim: "The focus of my works are 'Where I am' and 'How I feel'; the difficulties I face living as an International Student; cultural differences between Korea and the United States." In Diametric the questions are as simple and profound as the difference in black and white, which are appropriately the dominate colors. 10 x 5.5 x 2.5" magic wallet box using Jacob's ladder binding construction. 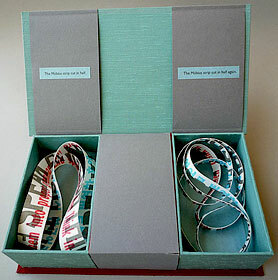 Three sections containing Möbius strips. Letterpress printed from polymer plates on Somerset. Cloth-covered box with Moriki and Canford Papers. Paper title label tipped on. Signed and numbered by the artist. Jana Sim: "The most difficult part of learning another language is everyday conversation where an immediate response is needed. Language Möbius is about my conversation process. The loop in my brain goes like this: hearing English, thinking in Korean, translating, then speaking in English. There are two layers to the Möbius strip – it can be cut in half. With the first cut, the ring becomes twice as long. The next cut makes the two rings link together. With each cut the sentences of the layers are also cut in half, making it illegible. The final two rings lined together symbolize the two languages tangled up in the artist's head while in translation, which is why the sentences can’t be read." 6.875 x 10.25 x 1.5"; 16 pages. Images and text printed using Epson Stylus Pro 9800 on Somerset Velvet Fine Art Paper. Laser cuts. Materials: leather, Moriki paper, plastic and linen thread. Single Page Coptic binding. Title blind embossed on a woman's silhouette of blue leather tipped on front board. The silhouette of an exasperated woman (hands on her head) of red leather tipped on rear board. Housed in brown linen clamshell box with title blind embossed on blue leather inset. 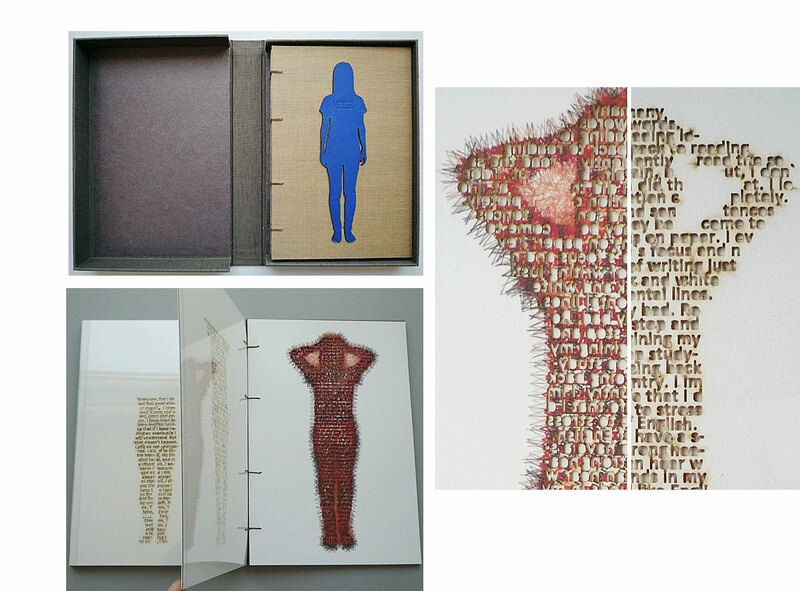 Colophon: "The altered text in the body shapes came from the book Why is that Art, which was required reading for 'Connected Studio' part of the core curriculum for the Interdisciplinary MFA program at Columbia College Chicago in the fall of 2009." Jana Sim: "Meter is about how I feel when I read something that's too difficult. Many required readings as part of my studies in the Interdisciplinary MFA program at Columbia College, Chicago were very difficult for me to understand. Each page shows my stress level riding gradually. The English words and information pile up to the point where it feels as though my brain can't take this anymore. I took the outline images of myself gradually changing color as the stress gauge increases. 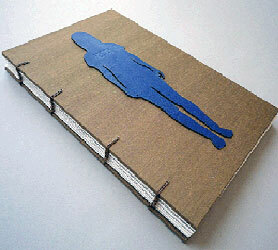 The words inside the body are laser-cut backwards and are readable from the back of the page. They describe how I feel at each stage, as my distress becomes greater and greater."